Blueberry jam fruit spread Horvat Bruneck. Made after Grandmother's recipe with the finest fruits controlled cultivation. Fruit portion 50 gr. on 100 gr. Finished product. 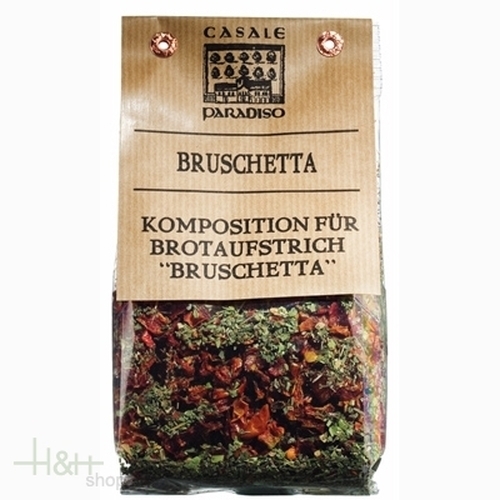 Mixed Herbs for Bruschetta 100 gr. - Casale Paradiso 4,75 EUR / 4,75 €/100 gr. Marine Salt with Rosemary 120 gr. - Casale Paradiso 3,45 EUR / 1,73 €/100 gr. Sea Salt Sal fiore di Romagna with cotton bag 1 kg. - Salina di Cervia 7,30 EUR / 7,30 €/kg. Himalaya Salt Rose 300 gr. - Casale Paradiso 8,45 EUR / 2,82 €/100 gr. Salt Cervia Riserva Camillone 750 gr. - Salina di Cervia 9,10 EUR / 1,21 €/100 gr. Red Salt Hawaii 250 gr. - Salt the World 8,90 EUR / 3,56 €/100 gr. Crystals Salt Natural Cyprus 60 gr. - Casale Paradiso 6,15 EUR / 10,25 €/100 gr. Marine Salt with Chili 130 gr. - Casale Paradiso 3,45 EUR / 2,65 €/100 gr.